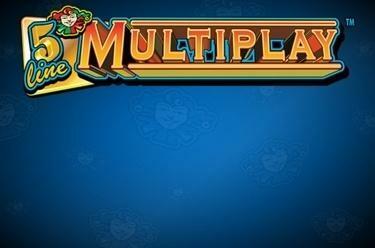 Play 5 Line Multiplay™ online for free now! The usual suspects have all gathered here – fruits, the red hot 7, a star and the Joker – but there’s still an aura of mystery to all of this! 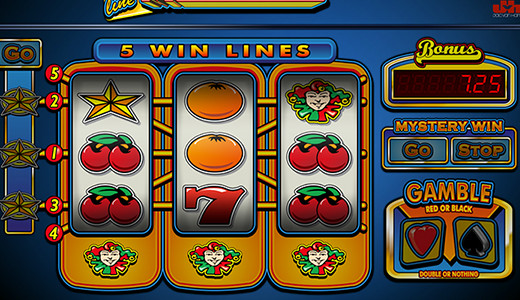 Are you able to gather enough stars in 5 Line Multiplay™ to activate the Mystery feature, where every spin is a win? And let’s not forget about the Joker – that cheeky fool will hand out random bonuses as he pleases! 3 matching symbols on a win line – that’s all you need to win big! It doesn’t matter if this combination starts from the left or the right, but it mustn’t be interrupted by any other symbols. The Joker serves as the game’s Wild symbol and substitutes all other symbols, increasing your winning chances! If a Star symbol appears during regular play on the second reel and there’s no win, then the Star will be transferred to the display to the left of the reels and begin to glow. Should you achieve a line win, all of your collected Stars will vanish again. As soon as all three Stars are glowing, the “GO” display will begin to flash. If three Stars then appear on any of the win lines, the Mystery feature begins and every spin brings a win! During the Mystery feature, the “GO” and “STOP” display will flash alternatingly on the right side of the reels. During “GO”, another win spin is activated – but “STOP” ends the feature. The feature will only be extended if “GO” to the left side of the reels blinks or if a combination of 3 more Stars appears during the feature. The bonus display will show a new win value with every spin. That win amount is yours if 3 Joker symbols fall onto one of the win lines.